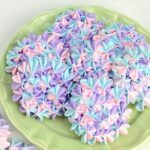 Few weeks back I shared with you how to make Vegan Royal Icing and then the emails and messages followed asking for a Vegan Sugar Cookies Recipe. I don’t follow vegan diet myself but know a handful of people who are vegan or are allergic to eggs or dairy, like my next door neighbor. I’ve tested this recipe several times, making small adjustments, testing different ingredients and after all that trial and error I’m ready to share it with you guys, with few tips and tricks, of course. First I wanted to talk about vegan butter substitutes. There are quite a few on the market. I narrowed it down to 2 I wanted to try in this recipe : Earth Balance Vegan Butter and Nutiva Shortening. I’ve been using Nutiva for some time. 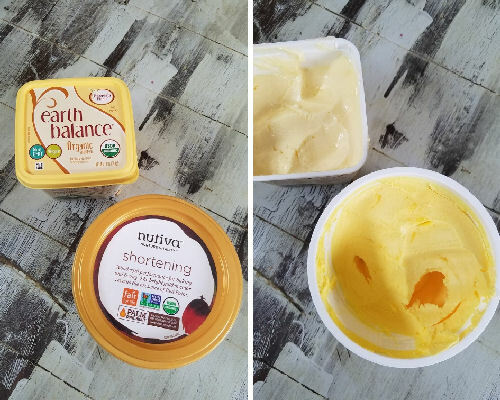 If you are not familiar with Nutiva Shortening check it out. It has a very light coconut flavor and golden yellow color and it doesn’t have to be refrigerated. Earth Balance seems to be the most popular among bakers, it is very neutral in terms of taste and color. Using both of these resulted in very tasty cookies. However, it was brought to my attention that Nutiva Shortening is made in facility that handles also unrefined oils of coconut, walnut and almond. I’m not sure if this makes it not suitable for people with nut allergies but it’s definitely worth mentioning. Nutiva is excellent in responding to emails and so if you have further questions you can email them. Now let’s talk about the finished cookies for a second. You’ll see in the picture below the butter color also reflected in the finished product. More yellow tones are achieved with Nutiva and lighter, very neutral tones are achieved with Earth Balance. I found that cookies with Nutiva baked with the crispier edges and they felt a bit oilier to the touch if that makes sense. They reminded me of old fashion, thin and crispy Christmas Cookies. Over the course of several days, stored in an airtight container greasiness dissipated. Cookies with Earth Balance baked softer and with the sharper edges. 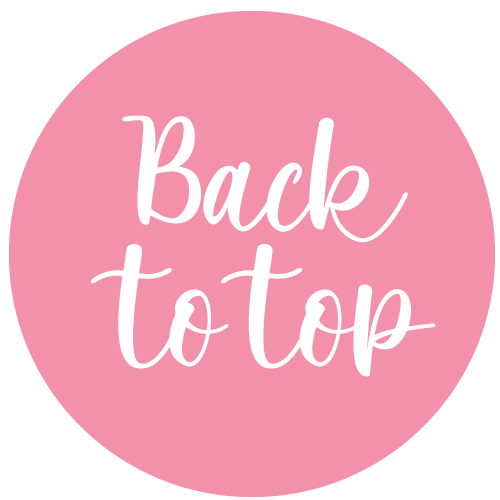 Now it’s time to talk egg substitute. To make the Vegan Cookies I decided to used Aquafaba- chickpea brine in place of an egg. I always eat chickpeas and I had some brine leftover so it just seemed practical to use it. It works well. 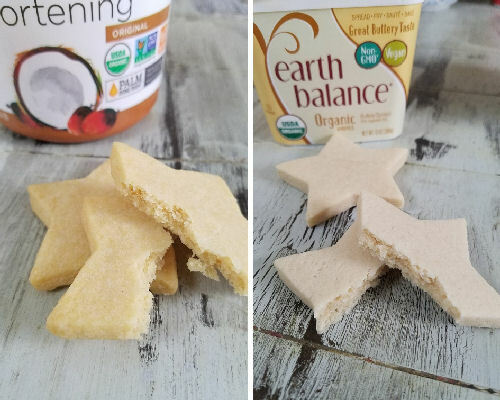 You’ll notice there is no salt added in this recipe reason being is Earth Balance and aquafaba I used both were already salty so I didn’t see the need to add more salt to the cookie dough. You maybe asking what kind of sugar did she use? I used Florida Crystals Organic Cane Sugar. 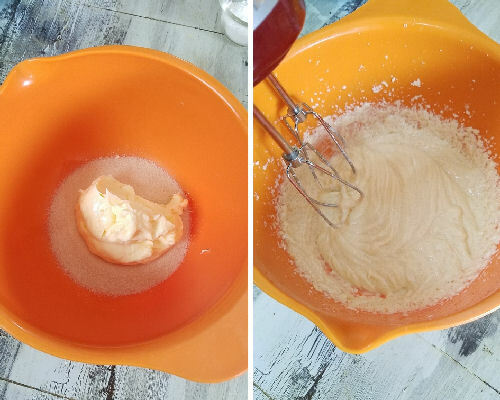 When adding dry ingredients (flour, starch and baking powder), beat the dough just until everything is moisten throughout and then use a spatula to gather the dough into a ball. Flatten it into a disk and roll it out right away between 2 sheets of parchment. I tried chilling the dough before rolling it out, don’t make the same mistake. It crumbles. 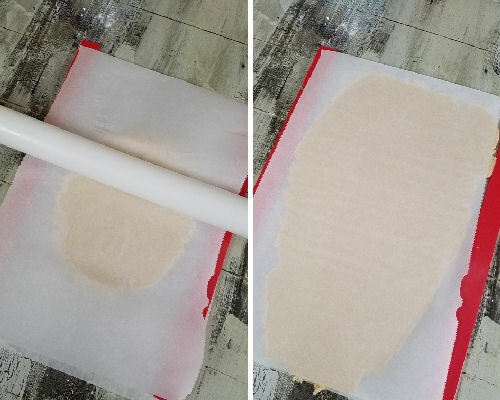 I rolled it between 2 sheets of parchment right after I mixed and it worked like a charm. On the sides I had 1/4 inch guides to ensure the even thickness throughout. You can watch the video below to see how how it’s done. Cream sugar and vegan butter for 5 minutes, until fluffy. 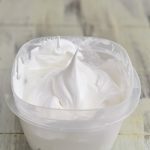 In a small dish combine aquafaba and vanilla extract and almond extract (if using). Gradually beat aquafaba mixture into the butter mixture. Then on low speed beat in flour mixed with corn starch and baking powder. Beat till everything comes together, lumps are okay. Don't over mix. 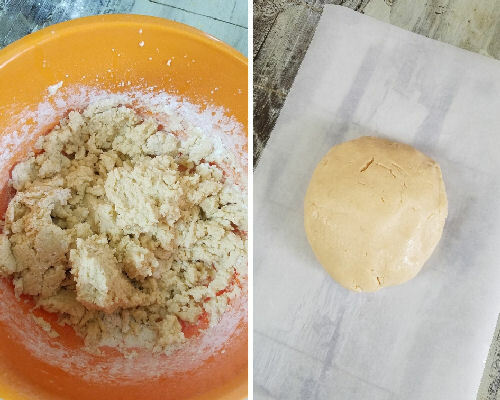 Gather dough into a disk and roll it out between 2 parchment sheets, using 1/4 inch rolling guides. Refrigerate for 30 minutes, or up to 3 hours. Peel of the parchment and cut out as many shapes as you are able. Transfer cut outs onto a light colored baking sheet lined with a parchment. 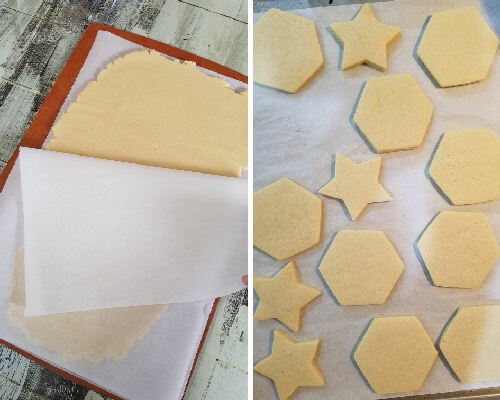 Gather the scraps and re-roll and cut out few more cookies. Bake at 350F for 9 -10 minutes. Cookies will be soft when they first come out of the oven, let them cool on a baking sheet for 5 minutes before transferring on a cooling rack. Cookie can be stored at room temperature in an airtight container for up to a week. 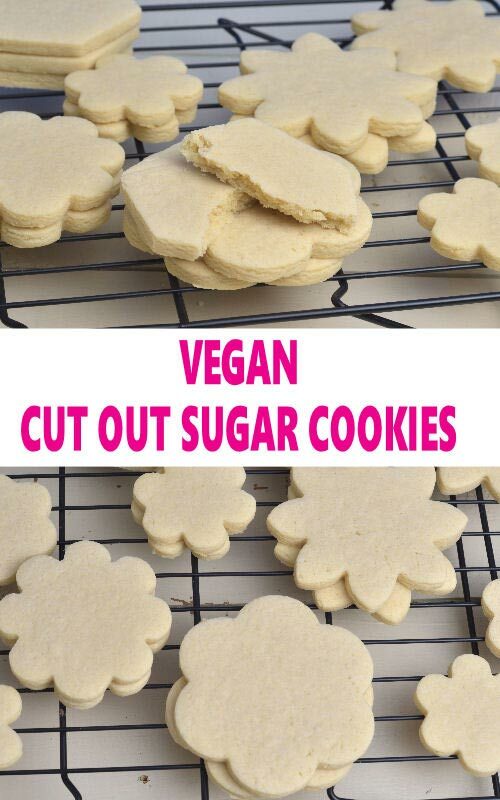 To decorate Vegan Sugar Cookies you’ll most likely need Vegan Royal Icing. 11/2 cup all purpose?? or is it 1/2?? 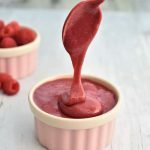 Can I use any egg substitute powder instead of aquafaba ? I’m making cookies for someone who is only allergic to eggs. 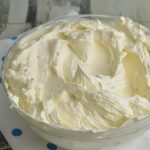 Could I use regular butter for this recipe? Thank you so much! 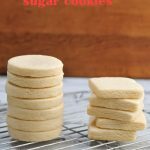 I have family and friends who are gluten free and vegan, and have always struggled with the right GF-V sugar cookie recipe. Many I am sure are great with the products other recipes suggest, but not all vegan products are readily available everywhere. I have had so many disappointing GF-V cookies. I just made this recipe using Pamela’s Artisan GF flour and am so impressed with how the dough handles – not sticky at all! 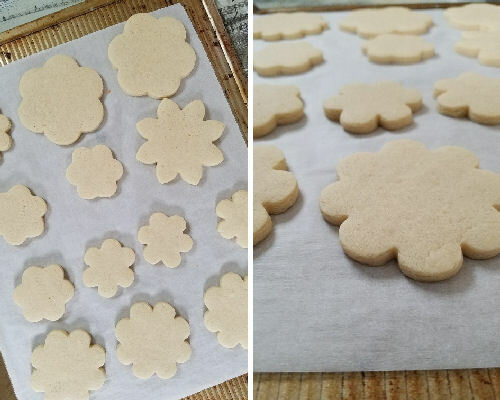 By using the associated video I was able to judge, as with any other sugar cookie recipe, whether to add a bit more flour to get the correct consistency. The cookies are out of the oven and ta da!! No spread either! Do I have permission to cross post? I belong to a couple of GF-V Facebook baking groups. thanks for letting me know about the missing recipe stuff. I just updated that bit. Please when sharing include a link to the recipe on my blog. Thank you.